Filling out the convention card — part 3 — NT Opening Bids cont. 3♣, 3♦, 3♥, 3♠: Ask a dozen pairs what meanings they assign to these bids and you’re likely to get a dozen different answers. There are many popular treatments, so it’s important that you discuss with your partner what these bids mean in your partnership. 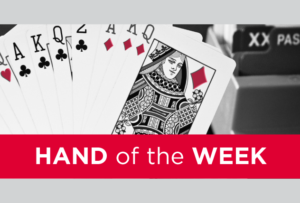 Many pairs play 3♣ and 3♦ as natural, but be certain you understand what strength these bids promise. Some pairs like to play these as weak; they’re a sign-off. Others prefer to treat them as invitational to 3NT promising a decent six-card suit. And others prefer to use them as strong and slam-going. If you play any of these treatments, no Alert is required. 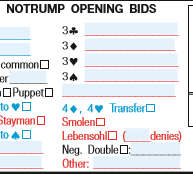 If, however, you’d prefer to use any of these bids to show, say, a two-suited hand (many pairs use 3♥ and 3♠ to show both majors) or maybe a three-suited hand (with shortness in the suit bid), that’s okay too, as long as you write a brief explanation on the convention card and Alert the treatment. Note that these lines are in RED, requiring an Alert. 4♦, 4♥ Transfer: Many partnerships use 4♦ and 4♥ as transfers to 4♥ and 4♠, respectively. This popular treatment is known as a Texas transfer. After partner opens 1NT, you may show a long major suit (with appropriate values) at the four level by bidding the suit one rank below the one you actually hold. Partner will accept the transfer by bidding your “real” suit. ANNOUNCEMENT: If you play this method, you must Announce “Transfer” to the opponents when partner responds 4♦ or 4♥ to your 1NT opening. The BLUE box indicates a bid that must be described to the opponents by an Announcement. After your 2♣ Stayman inquiry, partner has denied holding a four-card major. 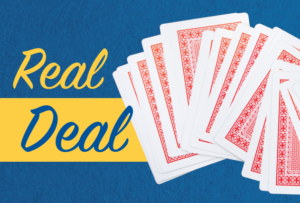 If you hold game-forcing values with five spades and four hearts, you know your side doesn’t have an eight-card heart fit, but you might still have a 5–3 spade fit. How to show this kind of hand? 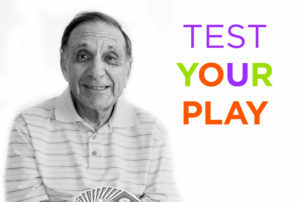 Playing Smolen, you may now jump to the three level in your shorter major (hearts) to tell partner about your pattern. Partner can then decide between 3NT and 4♠. If you have four spades and five hearts, you would jump to 3♠ instead. Smolen requires an Alert after the three-level jump. Negative double: Say partner opens 1NT, right-hand opponent bids 2♥ and you double. Many pairs play this as a good old-fashioned penalty double, but some like to play it as a negative double, promising values and length in the other suits, especially the major(s). If you prefer the latter approach, check the box. Lebensohl: When the opponents intervene over your side’s 1NT opening, it can be difficult to describe your hands accurately. For example, what does 3♣ mean in this auction? Since the “faster” auction denies a stopper, many pairs write the word “Fast” in the blank next to “denies” on the card. This treatment requires an Alert.